Saiterm has developed a new infrared heating technology that aims to improve heating quality, reduce internal energy consumption and make the environment healthier for humans. The “Spring” infrared heating system could radically change the way homeowners keep warm in the future. Infrared heating keeps people warm by creating the warmth of the sun on your face. Unlike gas or electric systems that produce air currents, “Spring” transforms every single watt of energy by heating people directly. When the body absorbs infrared heat, it increases blood circulation and improves the immune system by reducing inflammation and joint pain. From a technical point of view, there are different types of infrared rays, which are divided into bands of wavelengths from 0.01 mm (long wave) to 0.0008 mm (short wave). Halogen and quartz lamps use "short wave" bands and release intense light that is potentially harmful to the eyes. 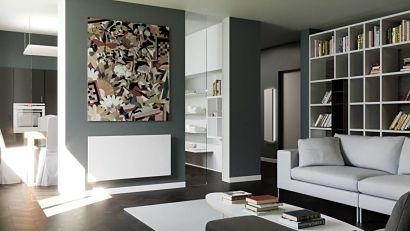 Saiterm has focused exclusively on long-wave infrared heating products according to the Council Directive 2006/25, and all their infrared panels emit thermal energy in full compliance with European legislation. Saiterm's panels release heat evenly and gently, enabling air temperatures to rise gradually and thereby making the home environment extremely comfortable. The panels require only 460 watts of power to reach over 85°C, thus achieving the best ratio between energy consumption and heat emission available. Compared to traditional gas and electric heating, the system offers homeowners substantial energy savings and is also cheaper than the more efficient rival models, even when compared to underfloor heating, which is on average 236 percent more expensive to manage. “Spring” is the most efficient heating system in the world, and I believe that infrared technology allows homeowners to reduce energy costs and protect the environment at the same time” said Salvatore Morale, CEO of Saiterm. “Embracing infrared technology, the world can live and work in maximum comfort respecting the atmosphere of the planet”. “Spring” is available for domestic and commercial properties and will be sold in different sizes. The system can be controlled remotely from a smartphone, tablet and thermostat and it can be easily installed on a wall or ceiling. It does not require piping or maintenance, making it an economical and ecological heating solution for homes and businesses, new or to be restored, or to improve the comfort of a single room.